CBB61 capacitor takes heavy edge metalized Al/Zn film as electrodes and dialectric. It is imprenated with flame-redardant epoxy resin and canned cubic ABS or PBT plastic case with characteristics of small size, reliable performance and long endurance. 1. As a national high-tech enterprise,we have 22 years experience in capacitor industry,25 industry patents and a number of invention patents. 2.To ensure the product quality and consistency,we have obtained the ISO9001 Quality system certificate and CQC product certificate. 3. We have modern factories and purification plant, the world first-class production equipment and the technical team consisted of a number of experts. We are committed to be top manufacturer in the world. Our company is specialized exporter, manufacturer and supplier of ac motor capacitor for table fan use in china. 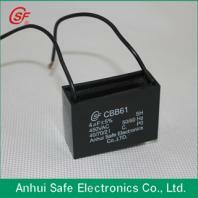 Company: Anhui Safe Electronics Co.,Ltd.